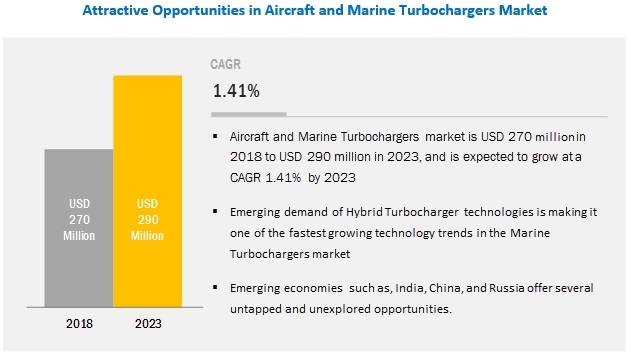 [126 Pages Report] The market aircraft and marine turbochargers is projected to grow from USD 270 million in 2018 to USD 290 million by 2023, at a Compound Annual Growth Rate (CAGR) of 1.41% from 2018 to 2023. The rising demand for fuel-efficient aircraft engines, increasing number of aircraft deliveries, rising demand for light jets from countries such as the US, the UK, China, India, and Japan, and flourishing maritime tourism industry across the globe are leading to the growth of the aircraft and marine turbochargers market. Based on component, the compressor segment is projected to be the largest contributor to the aircraft and marine turbochargers market during the forecast period. Based on component, the compressor segment is projected to lead the aircraft and marine turbochargers market during the forecast period. Compressor wheels, which are commonly made of aluminum alloys, are the common component used in turbos. However, some commercial diesel and performance racing applications of aircraft and marine turbochargers have started using titanium wheels machined on 5-axes mills. Though these wheels are extremely expensive, they do tend to avert premature failures of turbocharger components witnessed in high boost applications in aircraft and ships. Based on platform, the ultralight (turboprop) aircraft segment is projected to lead the aircraft and marine turbochargers market from 2018 to 2023. In ultralight (turboprop) aircraft, turboprop engines are used. These engines are the advanced version of the traditional jet engines, wherein engine inlets are equipped with propellers. These propellers are rotated at high speed using power produced by engines, which is transferred to gearboxes. The use of turboprop engines is limited to applications, wherein aircraft operates at low speeds because of the huge size of propellers. These engines are used mainly in general aviation applications. The market for turboprop engines is projected to grow during the forecast period as they are more fuel-efficient than traditional jet engines. The European region is projected to lead the aircraft and marine turbochargers market during the forecast period. The European region is estimated to account for the largest share of the aircraft and marine turbochargers market in 2018. The growth of the Europe aircraft and marine turbochargers market can be attributed to the presence of a large number of turbocharger manufacturers in the region that include PBS Velka Bites (the Czech Republic), Rolls-Royce (UK), and ABB (Switzerland), among others. Moreover, the stringent implementation of various emission norms in countries such as Germany, the UK, and France of the region is also leading to the increased demand for fuel-efficient engines, which, in turn, is contributing to the growth of the aircraft and marine turbochargers market in the European region. The major vendors in the aircraft and marine turbochargers market are Hartzell Engine Technologies (US), PBS Velka Bites (the Czech Republic), Rolls-Royce (UK), Mitsubishi Heavy Industries (Japan), Main Turbo Systems (US), ABB (Switzerland), Cummins (US), Kawasaki Heavy Industries (Japan), and MAN Energy Solutions (Germany). In February 2018, Rolls-Royce received a contract worth USD 47 million from the US Department of Defense to manufacture aircraft turbochargers for AE 2100D3 turboprop engine aircraft such as C-130J aircraft, C-27J transport, and US-2 seaplanes. In September 2017, ABB signed long-term service agreements with several marine and offshore transport firms for the service maintenance of 400 turbochargers units. In August 2017, Continental Motors Group launched CD-265 and CDR-285 piston engines with turbochargers for the aircraft platform. What will be the revenue pockets for the aircraft and marine turbochargers market in the next five years? Who are the leading manufacturers of aircraft and marine turbochargers in the global market? What are the growth prospects of the aircraft and marine turbochargers market in the next five years? The study on the aircraft and marine turbochargers market involved 4 major activities to estimate the current size of the market. The exhaustive secondary research was carried out to collect information on the market, its peer markets, and its parent market. The next step was to validate these findings, assumptions, and sizing with the industry experts across the value chain of aircraft and marine turbochargers through primary research. Both, top-down and bottom-up approaches were employed to estimate the complete market size estimation process. Thereafter, the market breakdown and data triangulation were used to estimate the market size of segments and subsegments of the aircraft and marine turbochargers market. In the secondary research process, various secondary sources such as Hoovers and Bloomberg BusinessWeek were referred to, so as to identify and collect information for this study on the aircraft and marine turbochargers market. These secondary sources included annual reports, press releases & investor presentations of companies, white papers, and certified publications, articles by recognized authors, regulatory bodies, trade directories, and databases. Key players in the aircraft and marine turbochargers industry and markets were identified through extensive secondary research. After arriving at the overall size of the aircraft and marine turbochargers market using the market size estimation processes explained above, the market was split into several segments and subsegments. In order to complete the overall market engineering process and arrive at the exact statistics for each market segment and subsegment, the data triangulation and market breakdown procedures were employed, wherever applicable. The data was triangulated by studying various factors and trends from both demand and supply sides based on component and platform. This research report categorizes the aircraft and marine turbochargers market based on component, platform, technology, and region. With the given market data, MarketsandMarkets offers customizations according to the specific requirements of companies. Further breakdown of the Rest of Europe aircraft and marine turbochargers into Norway and Denmark.